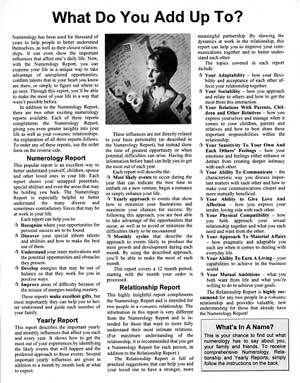 If you have already purchased the Numerology Report, Relationship Report or Yearly Report from Professional Numerologist, Version 5.0 or later, you can download a free, professionaly designed Sales Flyer and Order Form to help you promote and sell these reports. (If you had to hire a copywriter and layout designer to create a flyer like this from scratch you could expect to pay between $2,000 and $5,000.) This flyer is a Microsoft Word file that you can use as is, or can edit to add your own ideas. 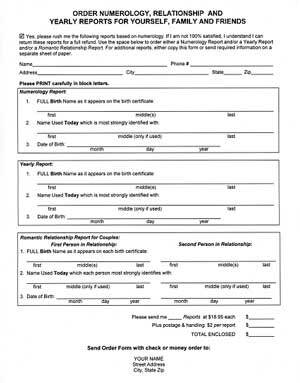 Just add your name and address to the bottom of the Order Form and you are ready to go. Before you can download this file, you will need to enter a matching Key and Activation Code combination for any of the above reports that you have previously purchased (version 5.0 or later). To find these codes, start Professional Numerologist and click on the Help menu, Activate Reports and Chart, and then Activate Reports/Chart. Enter the Key and Activation Code for any one of the above reports in the fields below.